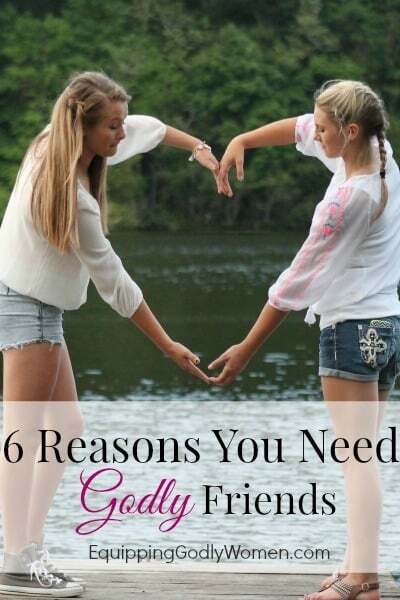 These are great reasons to have Godly friends! I pray to have more of them since I have found a new church home in the area we just moved to. They really do encourage you! So excited to see your new Friday link ups! Will I receive the notifications for it when I sign up on your site? Yay! I’m so, so excited too! I haven’t set up email notifications yet (it’s on my super long to-do list), but yeah, go ahead and sign up so when I DO get it set up, you’ll be the first to know 🙂 Tomorrow’s link up is going live tomorrow at 8 a.m. See you then! Do you have a close network of friends already? Love this post! Scheduled to share it in a Tweet this coming week. Blessings, Brittany! Oh yay! Thanks! I’ll have to check that out! Such a great post! Thanks for taking the time to write it …looking forward to more! Thank you so much for this post! I am a person who has a LOT of non-christian friends, and it can be hard to find other believers that I really connect with. Thank God for the internet and the communities I’ve joined and amazing women I’ve been able to connect with 🙂 I’m praying I’ll find more Godly friends in my real life! Thank you so much for this, this has been on my heart as of late and I am so happy to have read it, I am going to share with my Facebook friends bc it is something that needs to be read. This is a great post and I definitely agree! Thank you for the good advice. I have a few Godly friends in my life and they make all the difference some days. A good list. I would add they are the friends who never leave you. With the Holy Spirit as our guide, we are called to a lasting, deeper friendship than non-believers. When we do our part right! Well, not necessarily… yes, the friendships may be deeper, but there are some friendships that we only need for a short while. We don’t have to stay BFFs with every one forever. I am struggling with local friendships right now, and while I have wonderful online Godly friendships I am craving genuine face-to-face fellowship. As I read this list I found myself convicted about the kind of friend I have been too, though! I am often too timid about keeping friends accountable and speaking the truth in love when it is tough. Thanks for this reminder!! Finding real life friends is hard! I’m much better at finding online friends too. And yep, we have to be a good friend too, for it to work! Glad I could encourage you today! Love my sister’s in Christ!! So needed!! Great post with great points. I always say I’d rather have 4 quarters than 100 pennies…. Friendship is all about quality not quantity and strong godly women in your life is priceless. Great post! I’m the same! I don’t have a lot of friends, but I know I can depend on and share with the ones I do have. I’m the same way. I don’t have very many friends, but the ones I do have, I am very close to. And as an introvert, I like it that way. Some are online, but I think having a least a couple real-life friends is important too. Hi Brit, well I have very few of them in my life. they are a treasure I won’t lose. Take care of you and God Bless. Please take a step back and consider how you approached your two articles on friendship. One was on the importance of having Godly friends and the other on the value of having non-Christian friends. Although I believe your article made many valid points, I felt your premise of Godly friends being Christian was very presumptuous. Many of the spiritual friends in my life, some who help me to aspire to a more elevated and Godly life who are not Christians but do have a belief in God and shared values. Conversely, there are Christians I know, who do not hold themselves or me to a higher standard, making them less than ideal friends. Just a thought…. I totally agree that not all Christians are Godly (though the two SHOULD be synonymous, they aren’t always). That’s why I put “Godly friends” and “Non-Christian Friends” instead of Godly and non-Godly or Christian and non-Christian. With these two articles, I was only trying to focus on the two groups and not all the others for the time being. But to address the point I think you are trying to make–yes, friends who aren’t Christians but who aspire to live a good life are important to have. BUT they can only help so much. After all, if they don’t believe all the same truths you do, they can’t hold you to all of those truths or encourage you in all of those truths the way that other “Christian AND Godly” friends could. I have had friends who have encouraged me and challenged me who aren’t Christian, but you do need friends who are actually practicing Christians as well. To give an example: If you really wanted to learn how to be an Olympic swimmer, you wouldn’t just hang out with friends who weren’t swimmers who could encourage you to practice. You would need to hang out with other really talented swimmers who really need the ins and outs of the sport as well. Hope that makes sense! I really appreciate this article it has helped me to realize that I need to wait on God to send me Godly friends and not try to make it happen myself. I love to pray for people and encourage them but I want sincere godly friends to do all of these things for me that’s listed in the article. I would do it for someone else. Trying to make friendships with women in your forties is not easy. Everyone is busy with their own life and family and all the other aspects of life. I do not want friends who are only interested in me to boost their career or ministry or selfish desires. I am happy when women are successful in every area of their life. I want women who really care about me as person and daughter of God not what I can do for them. I live in Paterson and many women will not come to my city to pick me up if I needed a ride. I want friends who will not judge me or share my information with the world if I share it in confidence. I want friends who talk with me not against me or look down upon me because I do not have a college degree or a job or whatever it is they feel I should have in order to be in their life or seen in public with them. For me life is not about what I have or do not have it’s about my genuine relationship with God and people. I know that people are busy but I take very good care of my family and I am loyal when I know someone is truly sincere and truly think about me instead of their own needs all of the time. I am tired of consistently trying to make everyone else feel good about themselves while I get their left overs or silence. I know all about God’s love and how we are suppose to love one another. Yes, I am sincere when I give someone a compliment or encourage them I do it from my heart. No one likes to feel like they are being taking for granted or truly unloved or not even appreciated, especially women. Women need to feel loved and men need to feel respected. I think I will take time in pray to work through my feelings and disappointments and allow God to heal me. I really love this article and I am in the process of learning how to be a healthy friend. I have a lot of regrets from past friendships that ended weird. Please keep me in pray. Thanks. I don’t think those things are too much to ask at all. And I also don’t think it’s a “40s thing” too–people are just busy. Have you tried connecting with other women at church, at work, or through volunteering? Most people won’t be a good fit, but once you find a few good friends–they are definitely worth holding on to! This has really been a tough topic for me that i have been praying about. I have friends who are both Godly and non-Godly and i have been really wondering what to do. Well, i’ll rethink alot for sure. But maybe God uses the non-Godly friends you have for you to help them become closer to Him. Sooo, let’s just pray about the people we have, ask Him to make us know Godly friends who will move us up and towards Him and also for Him to use us as a vessel for Him.